Termite treatments, if done correctly, are the best way to protect your house from possible termite attack. There are a variety of termite treatments used to prevent termites from entering your home and doing damage to its structural integrity. 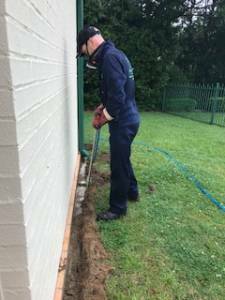 A 150mm x 150mm trench is dug around the perimeter of your home, against the wall. A chemical termiticide is applied to the trench, the trench is backfilled and the termiticide is applied to the soil as you go. This ensures that all the soil in the trench is treated. Where there is any solid ground, such as concrete: holes are drilled through the concrete, and the area under each hole is injected with the termiticide. This method has been in use for many years, and It works well if the soil is not disturbed. However, if the soil is disturbed by, for example, gardening or a dog digging, the barrier is broken and becomes ineffective in that area. NOTE: Termidor © is the termiticide we use and recommend for all barrier termite treatments in and around the home or business premises. A trench is dug around the perimeter of the home, and a series of pipes, the reticulation system, are installed in the trench. The trench is backfilled and the pipes are filled with termiticide. 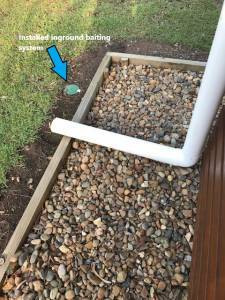 However, as the reticulation system is buried, damage or blockages to the system are not easily detected and can leave unprotected gaps in the barrier. Also, when the system is re-filled every 3-5 years (as required) your pest control operator can’t guarantee that some of the pipework isn’t damaged or blocked. This system is monitored during the year by the termite technician for any signs of termite activity. The Bait Monitoring System is the one we prefer to install here at Sunnystate: because it’s always active, giving your home the best protection against termite attack. Once the Bait Monitoring System is in place, any termites in the area around your home will seek out the active bait and start eating it, instead of your home! This is using the termite’s natural instincts against them: as termites never stop searching for new food sources to ensure the survival of their colony. In eating the bait, the termites are doing exactly the opposite. Hopefully, this has given you some insight into the different termite barrier systems that can be installed around your home to keep it safe from termites. For any help deciding which termite barrier system you need call or email us for expert advice.